TV screens, computer screens, phone screens, and more. It’s practically impossible to escape them. Technology is everywhere, including the office. Which isn’t a problem, until it’s abused. Millennials are often seen as the worst offenders. They’re constantly on their phone scrolling through Facebook, Pinterest, Twitter, or Instagram. This isn’t a problem with older generations! So if it’s a problem we all suffer from, what can we do to fix it? Not all employees know what proper screen etiquette in the office looks like. Although it varies depending on your manager and place of business, below are a few tips to keep in mind. “You only get one first impression.” Odds are you’ve heard that, or some variation of it, more than a few times. And it’s true. Especially in the workplace, where, depending on your position, you might have multiple first impressions with new clients or customers every day. When talking to someone, talk to them. Actively participate in the conversation. You don’t want to ruin those impressions because of something as silly as your phone. So don’t keep your eyes glued to it! It was rude in school and it’s rude now. Especially during a meeting or presentation. And steer clear of attempting to hide your phone under the desk—the boss knows what that blue screen glow means. Of course, depending on the position, it’s possible you might need to check your phone during meetings. Maybe there’s a client that won’t stop calling, or a minor emergency that needs to be taken care of. In those cases, discreetly access your phone and take care of the matter quickly. If the issue requires all of your attention, ask to step out to take care of it. This next one will vary depending on where you work and what the position entails, but it’s usually a good idea to stay off social media until you get a better idea of what the workplace culture looks like. If you’re liking Aunt Gertrude’s garden pics, you aren’t being productive. Although it might just be a quick break for you, others could think it represents some sort of trend. You don’t want to be seen as the office slacker, so avoid it. It’s important to note that there are plenty of valid reasons to be on social media—checking the company’s social media page, connecting with potential clients, etc. You’ll need to make some of your own judgment calls on what is and is not acceptable for your workplace. In the end, what really matters is that you’re doing what you’re paid to do. Obviously, not all employers are going to be as lax as Professor Detroyer, but you know if you’re getting the work done and meeting deadlines. Don’t do anything, on screens or otherwise, that jeopardizes your work ethic. But does your job end at deadlines? Nope. So instead of spending time on screens, brainstorm new projects ideas or create new responsibilities that go above and beyond your job description. Are there any issues with technology useage in your office? Let us know in the comments below! In today’s changing work culture, retirement is no longer a certainty. Traditionally, retirement was something that was more or less expected. You put in the extra hours while you were young so that you would have the freedom to do whatever you wanted in your later years. However, various cultural and economic factors have led to a change in this traditional retirement model. 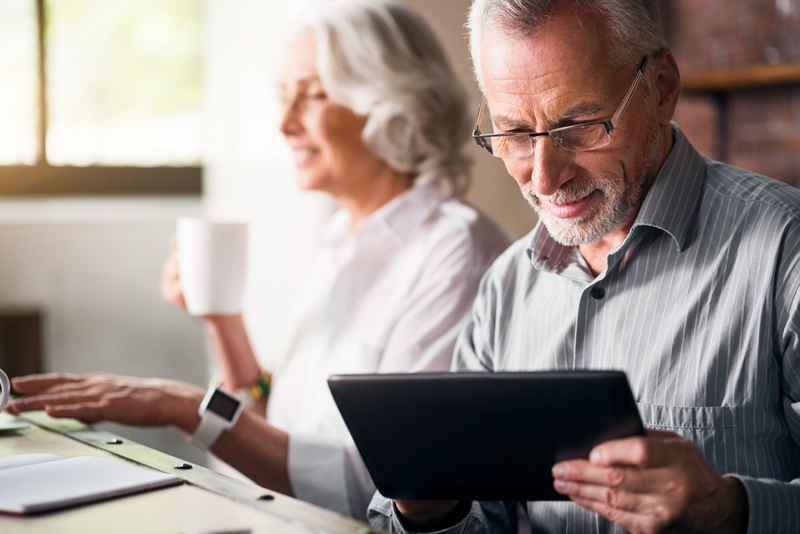 According to the latest data from the U.S. Bureau of Labor Statistics, as noted by Bloomberg, approximately 20% of Americans over the age of 65 are still working. Twelve percent don’t ever plan on retiring. Given the immense size of the baby boomer generation, this means that the U.S. work force is older than ever before. Why might you end up working past the traditional retirement age? Bloomberg mentions that baby boomers more frequently don’t have any retirement savings to speak of. They were hit by both the tech bust of the late ‘90s and the financial crisis of the mid 2000s, losing what little savings they had just to pay the bills. Our white paper covers the Baby Boomer retirement situation more in depth. Millennials are already encountering similar difficulties. As noted by CNBC, a recent survey from finance website NerdWallet found that millennials generally need to save 22% of their pay to have a successful retirement. Other experts say it should be something more like 15 %. One thing they all agree on is that the earlier you start preparing for retirement, the better. However, millennials are generally unable to save such a high percentage of their income. This is due to a combination of a fairly high cost of living combined with the need to pay off expensive student loans as quickly as possible. Many people simply enjoy working. It gives them a sense of purpose— that they’re truly accomplishing something. They love their work family and environment, and managers go the extra mile to make the office feel like home. The money and benefits don’t hurt either. Work is what you know, work is what you like, and work is what you’re good at. So why not stay in the workforce just a bit longer? Many people choose to stay in the workforce so that they can continue to pay off their debt. They can’t budget enough savings. Given the increased costs of education and housing, as well as the aforementioned tech bust and the financial crisis, it can be hard to allocate funds to a retirement account. Instead of paying off loans and saving at the same time, many workers choose to pay off their loans first. This results in a fairly significant loss of savings. And that’s okay! Some people can’t afford to retire in the first place. Others find retirement dull. And still others want to keep working because they love it. Regardless of whether you’re just starting out or are looking for a career change later in life, we’re here to help. Headquartered in Oklahoma City, OK, Express Employment Professionals is a leading staffing provider in the U.S. and Canada. We employed a record 510,000 people in 2016. If you have any questions about the job search, feel free to contact your local Express office or create an express account to apply for jobs online. Do you plan on working past traditional retirement age? Let us know your reasons why in the comments below!